Cook without oil, butter or grease with Red Copper® Square Pan! Multipurpose pan replaces specialty pans because it can broil, bake, sauté, fry, steam, braise, deep fry, and roast! Made with copper-infused ceramic, the nonstick and scratch-resistant surface wipe clean in a jiff. Tired of food sticking to your pan? Fed up with clutter in your cabinet? We've got the solution - Red Copper® Square Pan, utilizes the latest nonstick cooking technology with a 5-layer construction. READ FULL DESCRIPTION The Square Pan allows you to cook 8 different ways, replacing bulky specialty pots and pans. It's a skillet, fryer, roaster, baking pan, and more! Red Copper® Square Pan has 4-inch high sides that prevent splatters. The copper-infused ceramic cooking surface is nonstick and scratch-resistant so you never have to scrub. Everything slides right out of the pan! You'll cook healthier meals without needing to use extra butter, oil, or grease. Get up to double the cooking space thanks to the square design. It has a non-toxic, PFOA- and PTFE- free cooking surface so chemicals won't leach into your food. Red Copper® Square Pan is oven safe up to 500-degrees Fahrenheit. Wonderful for baking a lasagna and broiling the cheese for crisped, melted perfection! Equipped with a helper handle, the Square Pan lets you easily transition from stovetop to oven, and vice versa. Aluminum rings on the bottom of the pan distribute heat evenly so there aren't any hot spots in your food. Use Red Copper® Square Pan to broil, bake, steam, fry, sauté, braise, deep fry, and roast. It's the pan that does it all! Get your Red Copper® Square Pan today for just $39.99 and pay nothing for shipping and handling. When you order, we'll also add the recipe guide, tempered glass lid, steamer rack, and fry basket at no additional charge! This offer won't last long so get yours today! **Refer To Stove Manufacturer's Instruction Manual Before Using on Glass Cooktop. 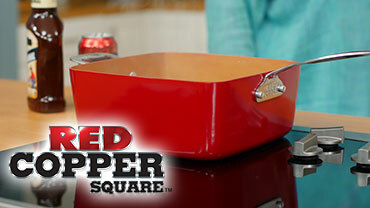 Hear from other Red Copper® Square Pan customers how much they love it, and why you will too! Check out all the news for Red Copper® and its creators at TeleBrands featured all over the world.